Unique and insightful information from my world of kava. Home » Kava News » Kava Clubs Preserving Tongan Culture! Kava Clubs Preserving Tongan Culture! Aloha, dear readers, and welcome to what I hope will be another wonderful year of kava-related stories! I’ve gushed many times about the power of kava to strengthen community and family bonds and make strangers into friends over the kava bowl. Recently, my belief in the power of kava was directly vindicated by a study from the Auckland University of Technology which demonstrated that faikava (“kava clubs” in Tongan) have become a locus for preserving Tongan language and culture in the modern age! Conducted by master’s student Edmund Fehoko (who is of Tongan descent), the study surveyed young Tongan men between the ages of 16 and 30 in New Zealand who regularly attended faikava, traditional men-only kava clubs. Fehoko said he focused on Tongan youth’s faikava attendance because there had been little research done on younger generations’ experience with the tradition. Faikava have been in operation in New Zealand since the early days of Tongan immigration, and each one is affiliated with a specific village back in Tonga. To make what could be quite a long story short, Fehoko found that young Tongan men who regularly attended faikava sessions reported feeling a stronger sense of cultural identity, and were also less likely to join gangs or use drugs and alcohol. Yet this cultural institution isn’t without issues, particularly when it comes to the role of women. 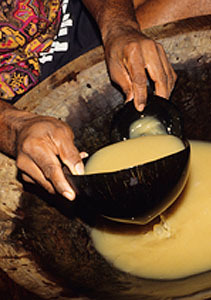 Fehoko noted that faikava are traditionally men-only; women serve the kava (considered a great honor), but aren’t allowed to participate in the sessions themselves. Along with noting that this makes women’s perspectives on faikava a promising area for further study, in a recent interview Fehoko stressed the need to establish safe spaces where young Tongan women could engage with their culture. In researching this article, I also discovered that the gender divide enforced in faikava can have political dimensions: Mele Amanaki, an unsucessful female candidate in Tonga’s last election, has recently called for more scrutiny into Tonga’s campaign spending laws—specifically those around how much money candidates should be allowed to donate to faikava. Ms. Amanaki justly pointed out that male candidates may otherwise have an unfair advantage because they can mingle with potential supporters and donors at men-only faikava, which female candidates have limited access to. “AUT Study: Kava keeps young Tongans out of trouble”. New Zealand Herald. Last modified Monday, December 1st, 2014. http://www.nzherald.co.nz/nz/news/article.cfm?c_id=1&objectid=11367162. Black, Taori. “Graduate Keeps Culture Alive Through Kava”. Maori Television. Last modified January 18th, 2015. http://www.maoritelevision.com/news/regional/graduate-keeps-culture-alive-through-kava. “Call for halt to kava club campaigning in Tonga”. Radio New Zealand International. Last modified January 7th, 2015. http://www.radionz.co.nz/international/pacific-news/263204/call-for-halt-to-kava-club-campaigning-in-tonga. A Huge, Well Researched Kava Knowledge Resource!! 1/4 lb. bag Mahakea Powdered Kava Root + Reusable Muslin Extraction Bag + 1 oz bag of Instant Cocoa Kava Drink (6) + 30% Kavalovetone Capsules + 10% Coupon on your next order. Is Your Kava GMP Kava? Yummy Recipes with Our Organic Maca Root!